So much can be written about pyramids. We now have evidence that the biggest pyramids were constructed more than 12,000 years ago (Atlantic Period). They are situated on a world grid with the prime meridian going through the Cheops Pyramid in Egypt, and they are encoded with a different (than ours) mathematics (see Carl Munck code). We find hidden chambers and tunnels underneath them, and they are present on every continent. The biggest pyramids on Earth were constructed in the Atlantic Period, Smaller pyramids were built at later dates when the knowledge of building them had been lost. Usually people think there are only pyramids in Egypt, and Middle America. However every continent has them, although sometimes they are not recognized by the scientific establishment. China has hundreds of them, some of very tall. For a long time they kept it a secret, and even today they don’t talk that much about them. 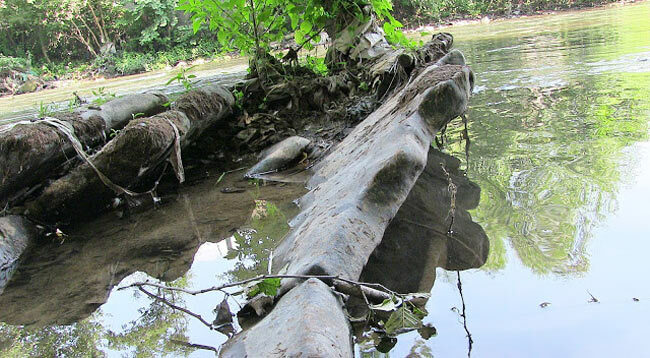 Tall pyramids, totally overgrown, recently have been discovered in Indonesia, as well as one large one in West Java! 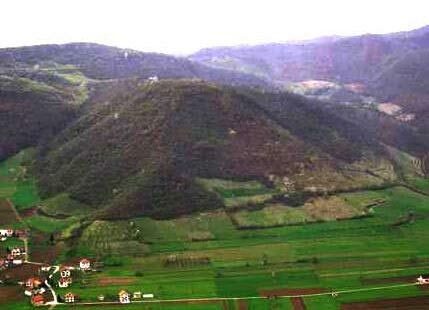 The pyramids in Bosnia were discovered in 2005, also totally overgrown. They have so much dirt and vegetation on them, that they must be very old. It is an important discovery because not only are they comparable with those in Egypt in size, but it also implies that once there was a thriving, very advanced civilization in Central Europe about which we know nothing. It is also important because the scientific community originally denied they are pyramids, but now most of them remain silent because the evidence of artificial construction keeps growing. The excavations and studies are being done by lay people and a few scientists who were willing to lose their reputation and embrace the possibility of new discoveries never dreamed of. Because it is in the hands of people who have open minds, discoveries are being made and will be made, without the heavy censoring of the orthodox scientific community, without the hiding and destroying of evidence that does not fit their theories. For example, it has come to light that Egyptologists know all the underground tunnels, cave, tombs and rooms in the Giza plateau, which they have been exploring and robbing in secret, while officially claiming they don’t exist. 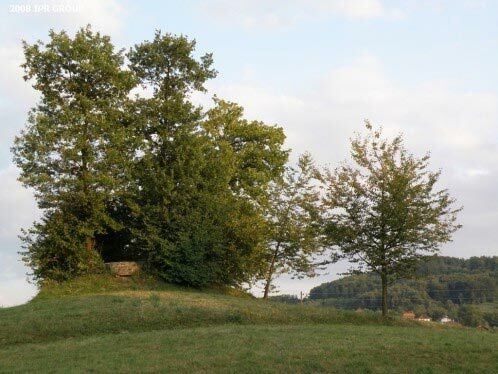 The Bosnian pyramids are important because it has become clear from in the beginning that the tunnels around and underneath the pyramids had been carefully closed and filled up with debris. At some time in the past someone had taken a lot of time and effort to seal everything off. That means that whatever lies down there, or inside the pyramids is still intact! Although I think they didn’t leave behind anything truly important, such as their advanced technology. A New Archeology has taken birth. Archeology is no longer exclusively in the hands of narrow minded scientists who only acknowledge evidence that supports their preconceived ideas about human history. Any evidence of advanced civilizations been systematically rejected by archeologists. They also view the past of humanity as primitive and uncultured. With the discovery of the Bosnian pyramids, all this is going to change. We finding very clear evidence of a technologically advanced society more than ten thousand years ago, being uncovered and investigated by a growing number of scientists with open minds, along with some ordinary people who bring many new and unconventional ideas, like pyramid energy. 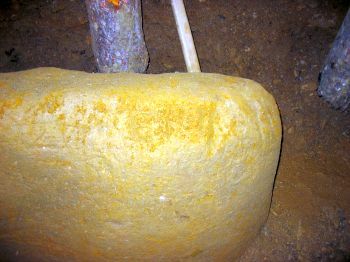 The discoveries are just starting, and it will be very interesting to see what develops..
A stalagmite in the Rave tunnel was dated at 5080 years ago. 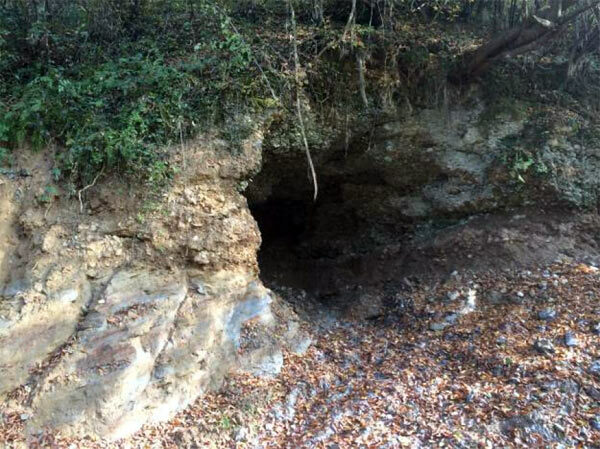 This suggests that the use of the tunnel was abandoned around that time, as one would expect that stalagmites would have been cleared when it was in use. The original construction of the tunnel is at least before that time. 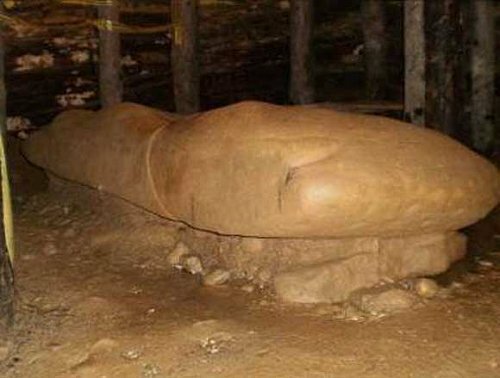 In 2008, organic material (piece of wood) was found in conglomerate material near a megalithic block in a tunnel. Sample was radiocarbon tested in Kiel Lab in Germany (31,000 years old) and Gliwice Lab in Poland (34,000 years old). It is also important to notice that although the pyramids and tunnels are more than 12,000 years old, certain finds might date from other cultures which have lived more recently in this region. Source of the “Central Fire” lies 2.5 km below the Sun Pyramid! 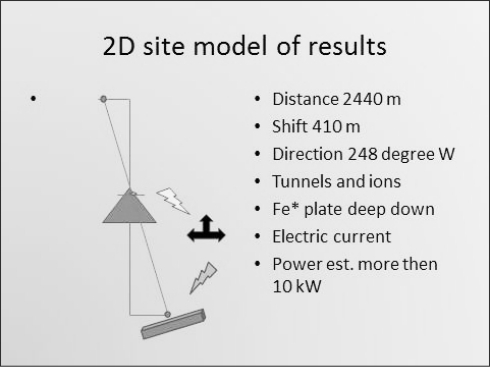 Dr. Slobodan Mizdrak, a physicist from Zagabria in Croatia, led a team of experts in April 2012 that carried out measurements of electromagnetic radiation at the top of the Pyramid of the Sun. The two-day experiment consisted of sending EM signals into the top of the pyramid. The results were processed in Vienna, Zagreb, and Belgrade, identifying the exact position of the energy source below the Bosnian Pyramid of the Sun, the biggest pyramid in the world. 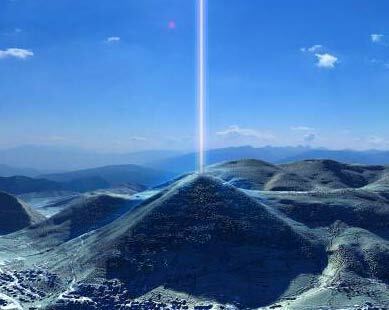 It has been proven that the source of the energy beam which is amplified in the pyramid and exits the top of the pyramid, is situated at a depth of 2440 meters (1.86 miles), with a displacement of 440 meters (0.27 miles) from the central axis of the pyramid. Analysis has shown that a metallic plate, in combination with negative ions and underground water flow, creates an electric power of more than 10 kilowatts. These results represent a pioneering step in the understanding of the world’s oldest documented pyramid. If you draw a line between the centers of the Pyramid of the Sun, the Pyramid of the Moon and the Pyramid of the Dragon, you come up with an equilateral triangle. 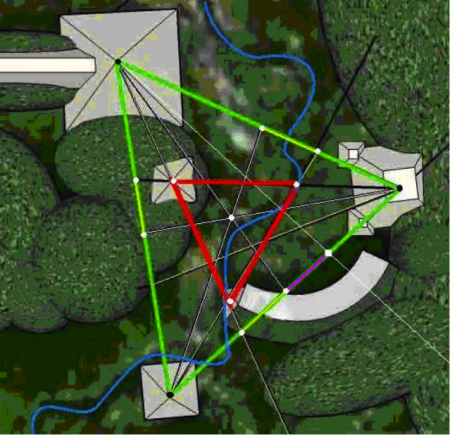 Each pyramid has a channel of water coming from it that meets at the center of the triangle. People drinking it for prolonged periods have said that their ailments have cleared up afterwards. Another map with the location of the pyramids. The top of the Pyramid of the Moon is covered with sandstone tiles. The flat top of the Pyramid of the Moon has a ‘well’, a deep hole. 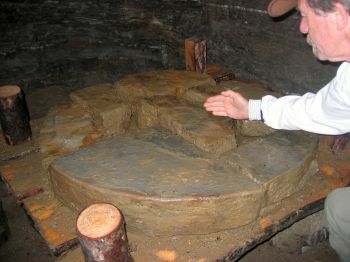 The hole has been constructed out of sandstone blocks. 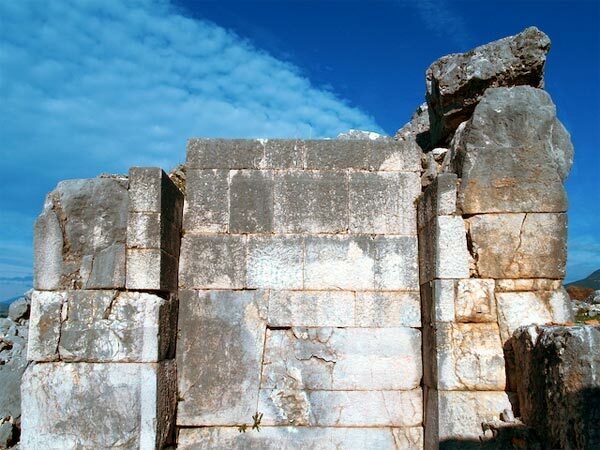 5 to 10 ton stone blocks are found on all sides of the Pyramid of the Sun. The entire pyramid is covered by these blocks (as far as has been uncovered), and they were man-made, a sort of concrete, molded into shape. “The concrete is manufactured from material taken from a locally deposited post glacial conglomerate; pebbles and cobbles of varying rock types and sandy quartz limestone. “Looking at the crystal grains within the material, we can ascertain that during the manufacturing process, the material was heated to above 500 degrees centigrade. That takes knowledge and technological know-how. 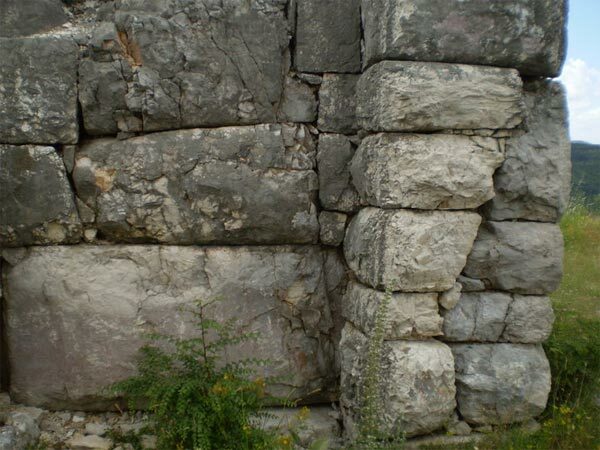 It seems that the whole pyramid was cut out of a natural rocky hill, and its surface was then covered with these concrete blocks. The concrete blocks are layered, interspersed with clay layers. Under the concrete is a series of sandstone blocks. Pavement on top of the Pyramid of the Moon. The Pyramid of the Moon is a very different construction. It is a mixture of clay layers, manufactured slabs and concrete blocks as well as natural stone. 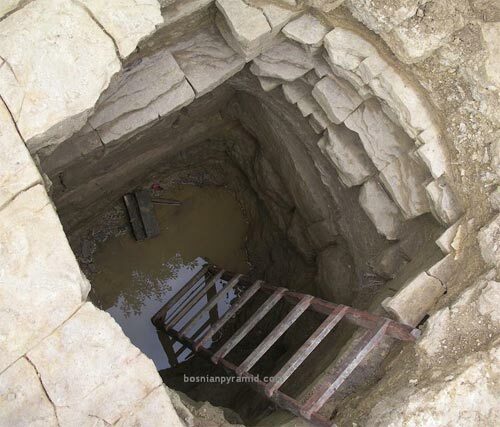 Beneath the Bosnian Valley of the Pyramids there is an extensive underground tunnel and chamber network which runs for a total of more than ten miles, connecting all pyramids and other places together. From in the very beginning (on discovery of an entrance) it was found that all side tunnels were closed of by stone walls and filled up with river bed material. It took a lot of time and work to remove some of them and take the fill material out. 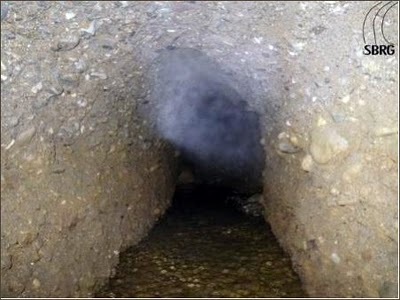 Following a tunnel that lead to the Pyramid of the Sun, they stumbled upon two open tunnels with water in it. They also had side tunnels that were walled of. One led to the Pyramid of the Sun. The entire tunnel was clear, with stone walls at the sides, and fresh water upstream. As the ceiling dropped, they continued to explore with a flat boat until the height was too small. 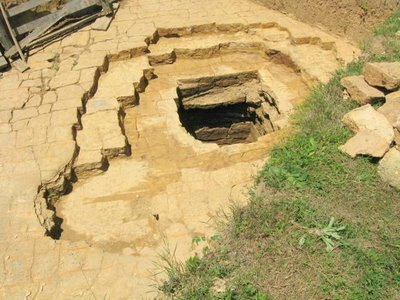 It looks like this was a channel from a water well which starts under the pyramid. See below for pictures. One of the problems with underground tunnels is air flow. The architects of the Bosnian tunnels solved this problem by varying the height of the ceiling. Air circulation in the tunnels is perfect and it allows normal breathing all the way. It was made possible by different ceiling heights that caused different air pressure pushing the air as a natural fan. Slope is at the 1,5 degree which is the same slope we use today for the fine water drainage. Negative ions concentration is dozens of time higher than average. It would make atmosphere clean of bacteria and viruses which would explain benefits to the human bodies inside this complex. 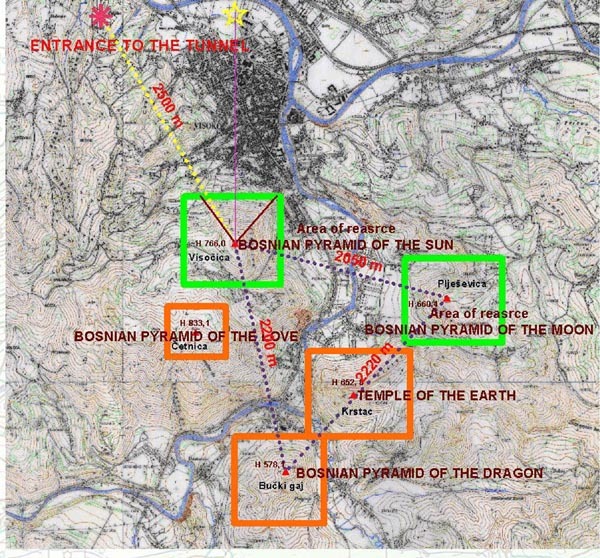 A big breakthrough happened at the Second International Scientific Conference on Bosnian Pyramids held in September 2011 in Visoko, Bosnia-Herzegovina, where Klaus Dona presented a map of the underground tunnel system present in the Pyramid of the Sun. The map came from a a friend of his who works with sophisticated ground penetrating radar from satellites. It shows several levels (depth) of tunnels, probably connected to each other by vertical shafts, and couple of chambers. Klaus Dona said that most of the chambers are empty, but one “contains bones, and something else that will surprise you when you find it”. The tunnels are color coded: light blue is 5 meters ( 15 feet) under the surface, white is 10 meters (30 feet) deep, blue is 40 meters ( 120 feet) deep, brown is 70 meters (210 feet) deep, yellow is 150 meters (450 feet) deep, black is 180 meters (540 feet) deep, red is 350 meters (1050 feet) deep. The circles are rooms or hollow spaces. Monolith blocks have been found in the tunnels. Here is one found in the Rave tunnel. Why they are there is not known. A large monolith in the rave tunnel, not far from the entrance. It seems to have been shaped by hand, and put on a support. This one, found in one of the tunnels, is a ceramic sculpture, weighing about 20,000 pounds. This would make it the largest ceramic object ever made in the world. 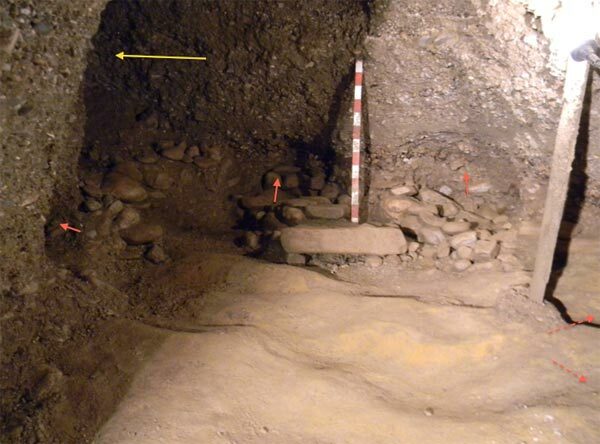 Remains of what is thought to be a column drum, broken in pieces, found the the KTK tunnel. 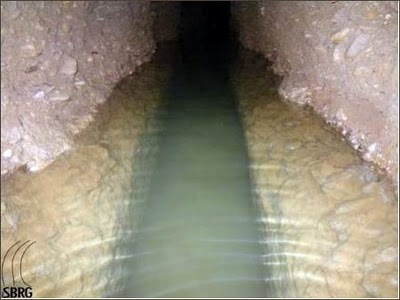 The water tunnel, a source of drinkable water charged up by the energy of the Pyramid of the Sun, as the well is situated underneath the pyramid. 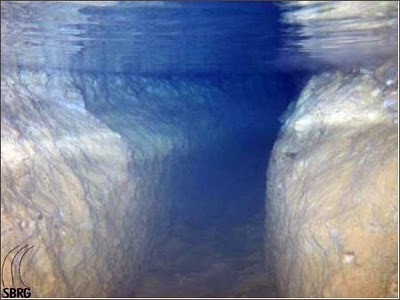 Below: a picture taken under water, showing a channel cut out in a clay layer. Up to now (2012)three chambers have been found in the tunnels. Here is one in the Ravne tunnel. It has small side tunnels, as usual also sealed of with a dry wall and debris. On the very first day of excavation, the 14th of April 2006, on the north side of the sun pyramid, the workers hit on stone when removing soil and clay. This piece of stone, which lay under 1,5 m of untouched soil on top of the breccia blocks, was revealed. The top is round with chisel marks and the bottom is square cut, with sharp edges. Who knows, maybe it is a sort of key. 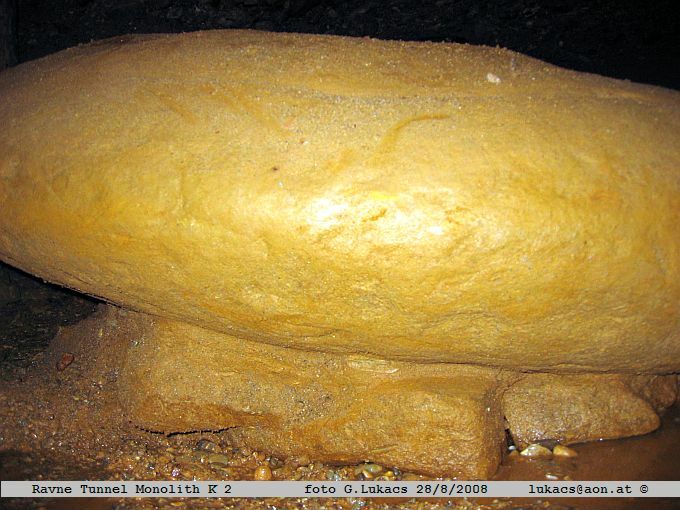 This stone was found in the Ravne tunnel in May 2007. It seems to be a mould for casting metal tools. 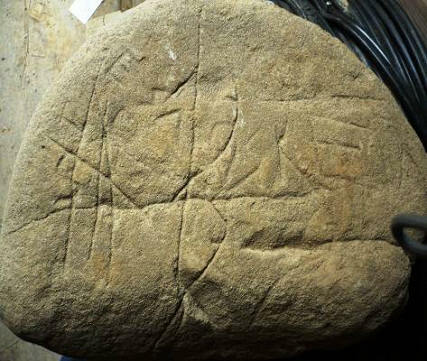 A stone with incisions found on the Pyramid of the Sun. 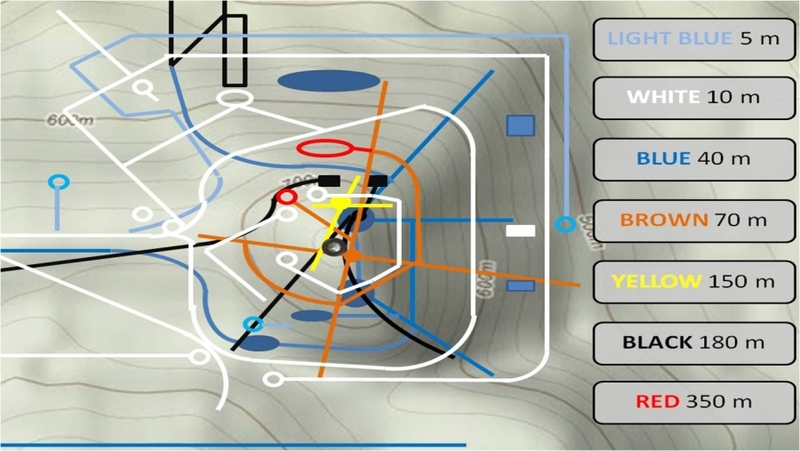 It turned out to be a map of the valley, with the positions of the pyramids, some tunnels and other locations. Called an amulet, an artifact comprised out of two kinds of stone materials, found on the slope of the Pyramid of the Dragon. A team of physicists detected an energy beam coming through the top of the Bosnian Pyramid of the Sun. The radius of the beam varies with time, from 5 to 20 meters with a frequency of 28 kHz. The beam is most of the time continuous and varies in strength during the year. Its intensity is not constant but modulates, and sometimes it is even absent. The beam can move around in a radius of 15-20 meters. After analysis of the sounds, it was found that the beam has a primary constant carrier and a second carrier over the primary. Its strength grows as it moves up and away from the pyramid. Questions: where does the sound come from, what generates it, for what purpose? Ultra and infra sounds were detected in the Ravne tunnels. A strange phenomena has been those who have been working in the tunnels. On a few occasions a compact mist form appears and flies through the tunnel as if it is a nebulous entity. It has been speculated that this indeed might be a form of intelligence, a sort of subtle energy beings. Here is a video of such an entity appearing and moving away, captured on video. 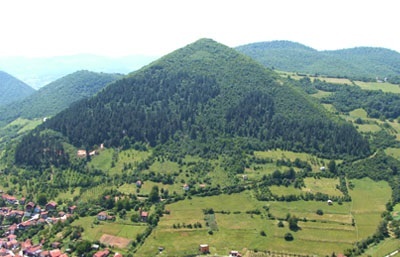 The Bosnian Pyramids by themselves show that they are the constructs of a very well developed society. It is only logical that such a society built more than just pyramids. Thus people have been looking around and, yes, they found other evidence. 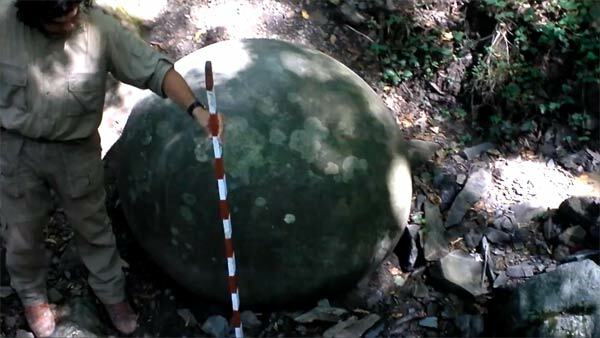 Large stone spheres have been found in Costa Rica and Middle America, associated with ancient cultures who were able to shape perfect spheres out of different rock, some of them very large. Well, Bosnia has them too! To archeologist they are just an artwork, but those who work with energy know that they are placed (if still in original position) on earth energy spots, and thus have a function in energy transformation or distribution. 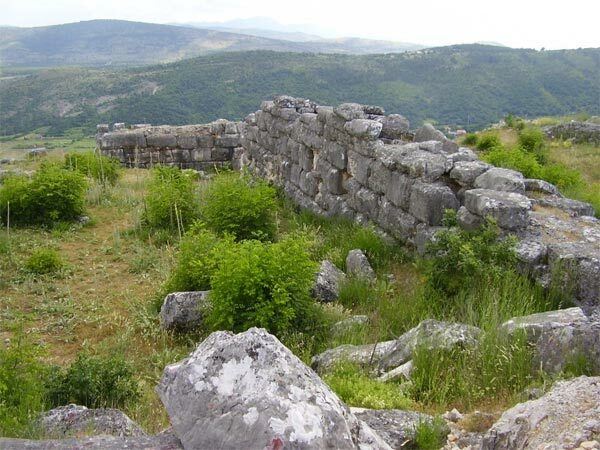 Bosnian of the Pyramid of the Sun Foundation has registered more than twenty sites in Bosnia and Herzegovina which have mysterious stone spheres, shaped and composed of various different materials: granite, volcanic rock and sandstone. 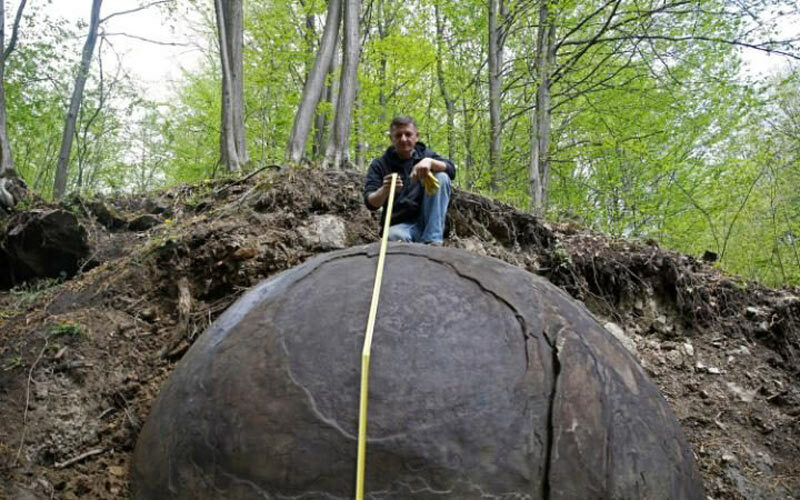 So far (2016), the biggest stone sphere found, in the town of Podubravlje in the middle of Bosnia. It has a radius between 1.2 and 1.5 meters (4 to 5 feet). Based on the brown and red color, it is assumed that is has a very high content of iron. if this is the case, then it must weight about 30 tons. 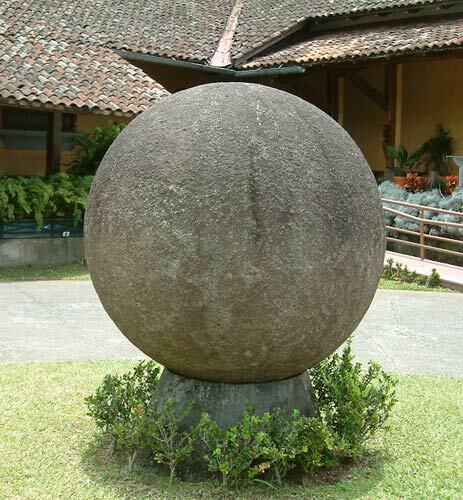 It might be even bigger than the biggest stone sphere in Costa Rica. 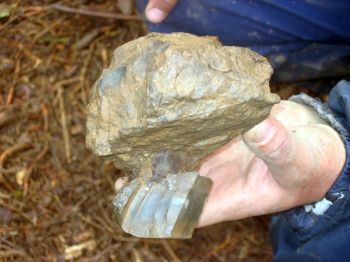 I think this one is a natural concretion sphere, because of the iron content and the presence of layered shells, clearly visible in the picture. Nevertheless, it might have been hauled from another place and positioned here for the distribution of the local energy field. We now know that the very ancient cultures have not a problem with moving very heavy, multi-ton stones. 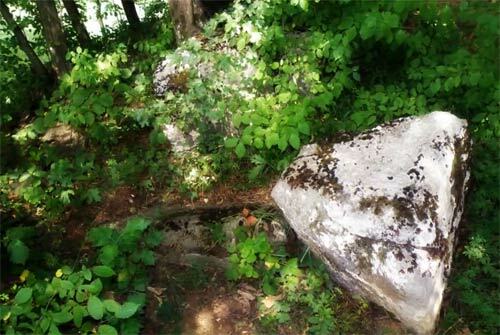 The following sphere is located in the “Deep Creak”, near Zavidovići-Central Bosnia. 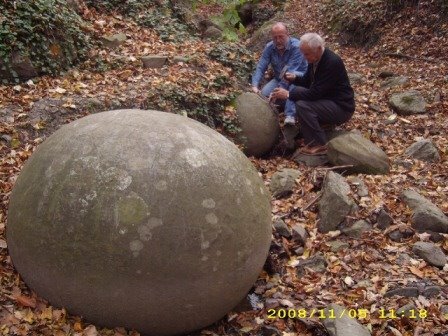 More than 40 stone spheres were found on this location, weighing many tons. 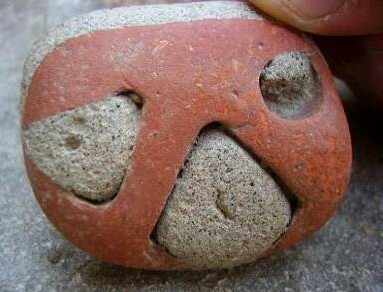 They are very similar to the stone spheres found in Costa Rica, Mexico and Easter Island. 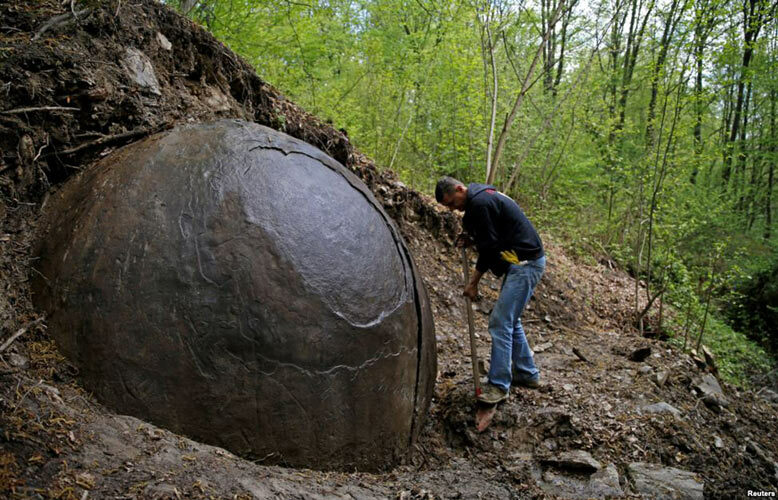 This stone ball found in Bosnia (near the village of Slatina, Banjaluka). A lot of spheres have been covered by dirt for thousands of years and are usually discovered by accident. The local population have sometimes moved them near their house. Some of them have been discovered recently in the woods. Some spheres are found near triangular stones. 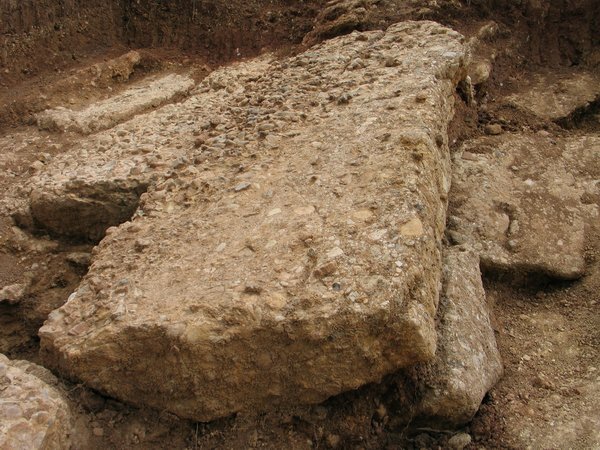 At Ginje, a village nearby the Bosnian pyramids, a tumulus (a hill shaped by man) was found, with large man-made stone blocks on top. The local villagers told that many of the stones of this hill were carried away for construction of buildings in their village. 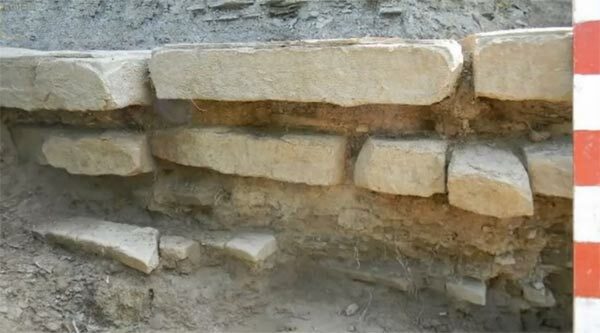 Archeologist tell us that some primitive tribes cut huge blocks of stones, right angled, surfaces flat and weighing tons, to construct their buildings, without considering they didn’t have the tools to move or lift them. 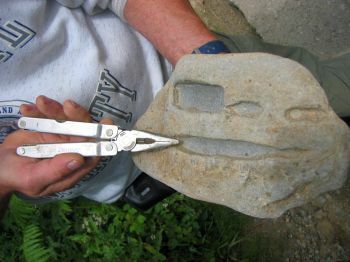 The stones have been cut so precisely that you cannot get a credit card in between. 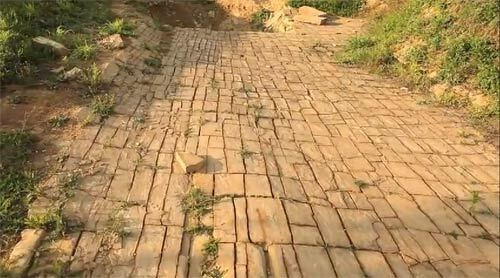 These stone blocks, and their construction, are the same as in Middle America (f.e. at Ollantaytambo, Machu Picchu and Sacsayhuamán) and other places around the world. 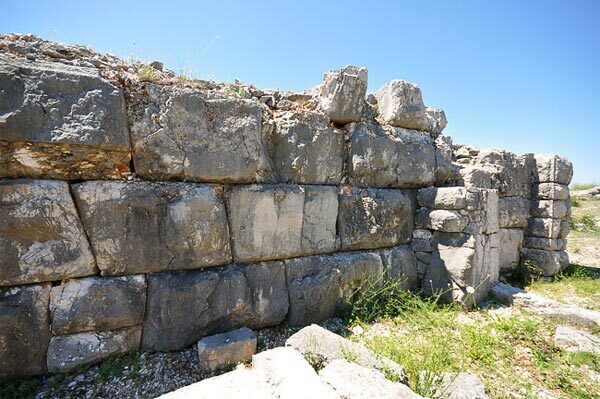 It doesn’t take much to see that the walls at Daorson were already there when the Illyrian tribes moved in. These constructions, now shown to also be in Europe, were once built by an advanced worldwide civilization. Jock Doubleday has examined the river Fojnica that runs through the valley of the Bosnian pyramids, and found that all along the river sides there was many remains of artificially created and placed clay blocks and plates that points to the shaping of the river by the ancients. 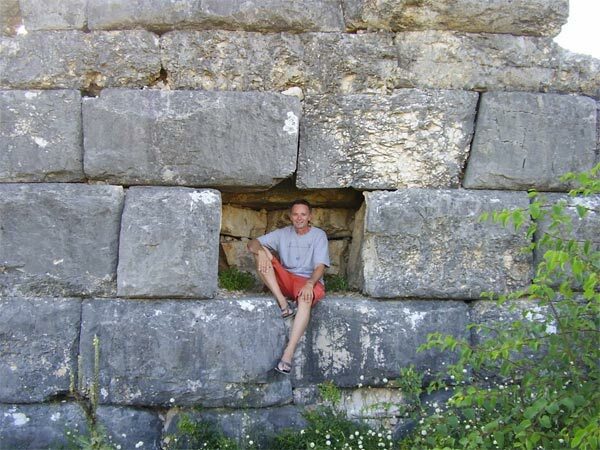 Visit his blog, with many pictures: An American in Bosnia.